Along your adventures in Legends of Honor, there's a chance that you'll encounter a technical problem with the game. If you find one, you can always report it to us in this section and help us improve the game for everyone! Reporting a bug is super simple, but there's a couple of ways that you can make this easier for us to reproduce, locate and squash once and for all. This starts with the thread title. 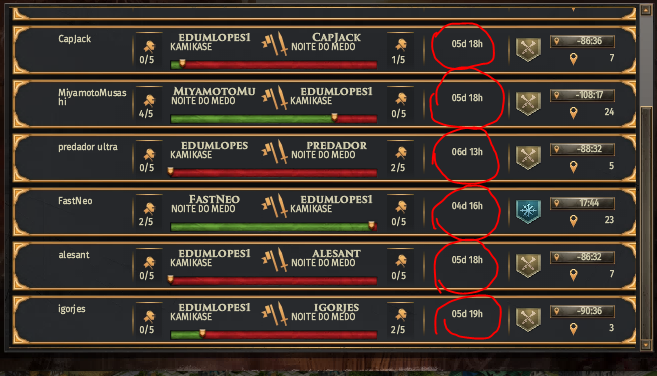 Try to keep it as short and informative as possible, for example: titles along the lines of "this is broken", "please help" or "found a bug" don't help us to quickly identify what you're having an issue with at first glance, whereas titles like "Bug with the Quest 'Something for the Coffers" or "Issue with collecting taxes" help us, the bug analysis team and even other players to quickly find out what it is you're having troubles with. What were you doing before the problem occurred? Is the problem constant, or temporary? In addition, you are welcome to attach a screenshot/video of the error message or problem in general so that we can see first hand where it is. Ensuring to provide us with this information can really help in eliminating these bugs and creating a smoother game for yourself and your fellow players. Thanks in advance for reporting problems to us! It really helps! Is the problem constant, or temporary? at this point constant. Description of the problem: every time I go to log in it tells me that I have invalid charters. I use only numbers and alphabet. When I reset it, I use the same password and it will work. Next time I go to log on again I get the same error message. It is very annoying, but not the fault of any person or clan. .
Am having real problems accessing the forum... this appears to be the only the third place that I can put a message! So any help there would be appreciated. This is the first time that I have been able to log in! Never had a forum like that before!! Why does the gift box keep disappearing? Is it Tuesdays and Thursdays etc? Am able to attack a castle multiple times before a shield descends... great for me but I don't want it happening to me. What is the ruling on this one? Don't get the hero upgrades.... need a help button the screen to take me to where I can get help on the item.... likewise the VIP and the caves are an anathema to me. Does it ever get to a point where you get rewards for 3 hours locking up a hero? What kind of message do you get when attempting to log in? The username and password should be the same as your game account. Have you maybe recently changed your password? The gift box is available every 2 hours, a total of 20 times. It is meant to give new players a bit more to get started with, but had to be deployed to all accounts in order to work properly. We are currently investigating the shield not being deployed when it should be. Missing since 48 hours ago. I signed on and those were so far and few between as to make it difficult to find any. Missing Level 18 Dark Warriors. Where did these go? Started 24 hours after last upgrade of game. There are rather large areas in all the realms with no warriors in those areas at all. Where did those go? I can see from the posts that the equipment for heroes is functioning. But for me it is greyed out. What is needed to switch it on? Bonus reward of 50 gems is not added. BUCOKABARNI9 JÁTÉKOS VAGYOK .Amocsáron kapott a szövetségünk egy játékostol3-tagunk támadást.a csata 3,-ik napja folyik és nincs vége. a támadások ujra indulnak. kérem nézzék meg a hibát és szöntessék meg. intézkedésüket előre is köszönettel,BUCOKABARNI9. Already 9 day our troops are stuck on the ice. Can not go back to the Alliance. A Winggové have it equally. I see that nobody cares. Daedulus7, playing Legends of Honor, using Firefox (latest version -- no problems there). I sent some units from one world to another and they arrived. I then sent a 2nd batch--they disappeared! i have a problem, i cannot scroll in the world map. i just see my castle and the area around it i cannot move the screen. i can attack and use my heroes within the unmovable boundaries.